Serena Williams and Rafael Nadal each moved into second place in the Emirates Airline US Open Series Bonus Challenge Sunday by winning Rogers Cup singles titles in Toronto and Montreal, respectively. Williams, the reigning US Open champion, moved within five points of the women’s Emirates Airline US Open Series Bonus Challenge lead by defeating Romania’s Sorana Cirstea, 6-2, 6-0, to capture her second Rogers Cup title in Toronto. 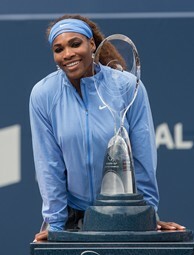 Williams won the Emirates Airline US Open Series Bonus Challenge in 2011. Nadal, meanwhile, won his third Rogers Cup title, defeating Canada’s Milos Raonic, 6-2, 6-2, in Montreal. Nadal, who won the Series’ Bonus Challenge in 2008, now trails leader John Isner by 15 points. Both Williams and Nadal received 100 Bonus Challenge points for their victories because of the Rogers Cup’s status as an ATP Masters 1000 and WTA Premier 5 event. Players must earn points in at least two Emirates Airline US Open Series events to be eligible for the final Bonus Challenge standings. The men’s and women’s winners of the Emirates Airline US Open Series Bonus Challenge will compete for $1 million in bonus prize money at the 2013 US Open. Click here for the Emirates Airline US Open Series Bonus Challenge leaders after Week 3. Next on the Emirates Airline US Open Series: The best players in the world will continue Emirates Airline US Open Series play at the Western & Southern Open in Cincinnati. As with the Rogers Cup, the Western & Southern Open is an ATP Masters 1000 event for the men and a WTA Premier 5 event for the women. Therefore, players will once again battle for more Bonus Challenge points, beginning with 15 points being awarded to those who reach the round of 16 and ending with 100 points awarded to the winners. Tennis Channel will televise early rounds of the Western & Southern Open from 11 a.m. to 11 p.m. ET Monday through Wednesday. ESPN2 will begin its coverage with the round of 16 on Thursday and continue through Saturday’s semifinals. CBS Sports will air the men’s final on Sunday at 12:30 p.m. ET, while ESPN2 will televise Sunday’s women’s final at 4 p.m. ET. The full television schedule can be found here. Now in its 10th season, the Emirates Airline US Open Series continues to serve as a true regular season of hard-court tennis, linking nine summer tournaments to the US Open. More than 200 of the game’s top players will compete during the Series for more than $50 million in prize money. Additionally, through the Emirates Airline US Open Series Bonus Challenge, the USTA will offer up to an additional $2.6 million in bonus prize money at the US Open to the top three men’s and top three women’s singles finishers in the Emirates Airline US Open Series. The Emirates Airline US Open Series Bonus Challenge has resulted in some of the largest paychecks in tennis history for men ($2.4 million–Roger Federer, 2007) and women ($2.2 million–Kim Clijsters, 2005 and 2010). Last year, Novak Djokovic and Petra Kvitova captured the Emirates Airline US Open Series titles.